The Skinny: Entertaining little multi-genre movie works thanks to engaging performances and effective direction from Herman Yau. This multi-genre flick is a true surprise. It starts off with Wu Chien-Lien as an unhappy young woman who offs herself, only to suddenly come back from the dead. It seems she used some Taoist technique called the “Walk In,” which allows her body to be used as a vessel to some wandering uneducated soul. 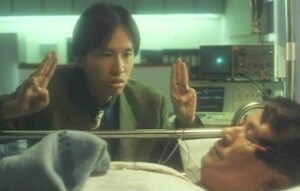 Flash forward to Dayo Wong as a young cop who gets injured during a bloody robbery and loses the use of his legs. Frustrated, he begs the now wise Wu Chien-Lien to teach him the secret of the Walk In and allow him a better life with his cop girlfriend (Yu Li). To do so, he needs a proper vessel - so he chooses the catatonic Chicken (Danny Lee), a stuttering loser who was shot during the same robbery that took Dayo’s legs. In return, he promises to avenge Chicken for his injuries.